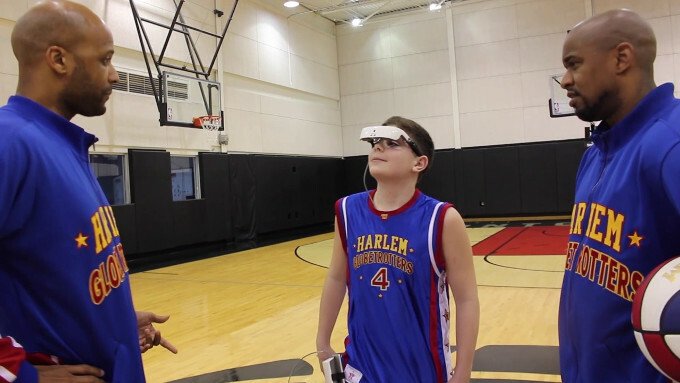 Ethan LaCroix, a 13-year-old boy who is legally blind, not only got to shoot hoops with the players of the Harlem Globetrotters, he was actually able to see them — thanks to technology from Toronto-based eSight. LaCroix has a rare eye disease called Leber’s congenital amaurosis, but wearing eSight’s electronic glasses allows him to experience life with normal vision. eSight’s electronic glasses come with a high-resolution camera that captures the user’s surroundings and then displays the image on Organic Light Emitting Diode (OLED) screens in a form more palatable for the blind eye. With the help of these glasses, LaCroix had the opportunity to spend time shooting hoops and learning basketball tricks with players from the Harlem Globetrotters, and receive a special tour of the CN Tower. Later today, LaCroix will sit courtside to watch the Harlem Globetrotters play at the Hershey Centre. Since its commercial launch in 2013, eSight has been disrupting the assistive technology space through its smart glasses. In February, the company revealed its latest glasses, eSight 3, to help the legally blind or those living with low vision to see with 20/20 vision. eSight said the device’s autofocus capabilities enable users to shift between near, mid, and long-range vision, and its Wifi and HDMI capabilities allow them to stream content and send pictures and videos. Also in February, eSight announced the launch of an affordability program aimed at improving access to the glasses by providing potential users with funding opportunities. In July 2015, eSight was reportedly achieving a public listing via reverse takeover by Damon Capital Corp. However, that deal never went through as eSight pursued a $14 million round.